Ahsan Manzil, the abode of Dhaka’s Kashmiri Nawabs. New Market is one of Dhaka’s busiest markets where thousands of shoppers visit daily. 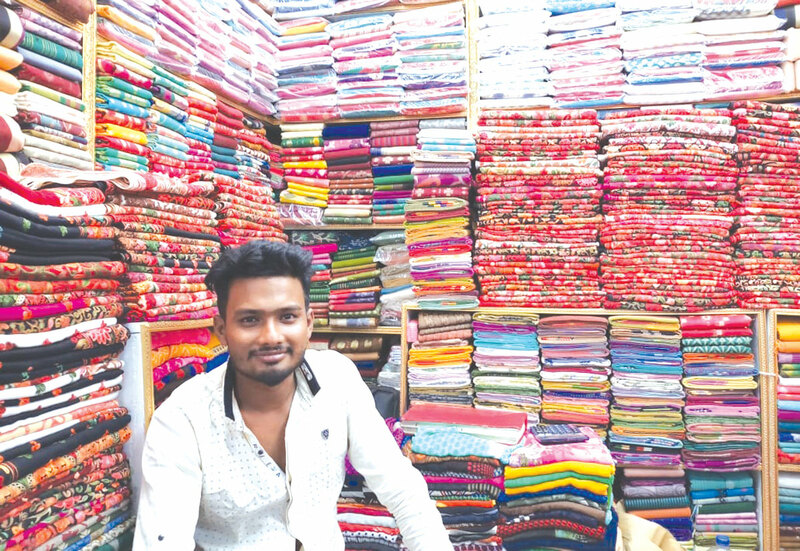 I saw four shops in this 53-acre market exclusively dealing with Kashmiri shawls. There might be more. Seeing Bengalis selling Kashmiri shawls I was reminded of Bengali Maulvi Sahab who lives in our neighbourhood in Hazratbal. Lot of people from Hazrtabal go to Kolkata during winters to sell shawls. And to cater to low budget customers they also sell Amritsari shawls. Moulvi Sahab approached a friend, a wholesaler, requesting that he also would like to sell the Kashmiri shawls during winters in Kolkata. But Moulvi Sahab had only one pre-condition: he wanted genuine Kashmiri shawls only. After a struggle of two months, the Moulvi Sahab was able to sell only one shawl, that too to an acquaintance who knew that he lives in Kashmir. He never tried his hand again in the business. He would always lament that Kashmiris are able to sell dozens of fake shawls in a day and he could not sell even two genuine ones during the entire winter. The only reason he could fathom was that buyers see the seller not what he is selling! Kashmiri shawls are a rage in Bangladesh too. And most of the shops get their supply of Kashmiri shawls from Kolkata. Shawls and other Kashmiri handicrafts have historically connected Kashmir with the rest of the world and Dhaka is not far away. But it is MBBS degree that joins Kashmir with Bangladesh more than anything else, these days. The officer felt embarrassed when I said his guesstimate was off the mark. But he was not to be blamed for getting it wrong. The fact is that almost every Kashmiri these days visiting Bangladesh is there either to secure his wards’ admission in a medical college or to meet the ones who are already studying medicine. Hundreds of Kashmiri students, particularly girls take admission in various medical colleges of Bangladesh. But for overpowering heat and humidity, the environment in and outside the colleges in Bangladesh suits our culture and traditions. With both Bengalis and Kashmiris partaking rice for lunch as well as dinner Bangladesh is a home away from home for Kashmiri students. It is not common knowledge that most of the American Treal that Kashmir orchards produce is consumed by Bangladesh. Owing to a good taste and small size, it is one of Kashmir’s most popular fruit in Bangladesh. Historically, this nation has been the sole address of this fruit. 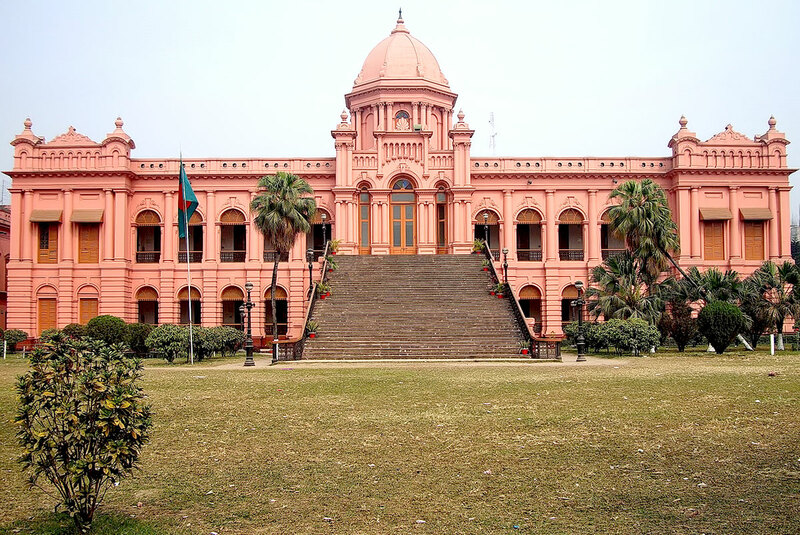 But Dhaka held a surprise for me, perhaps the biggest surprise once I went to see Nawab’badi, or Ahsan Manzil now a Museum in the heart of Dhaka. I knew about the role of Nawab of Dhaka in 1905 division of Bengal, starting University Of Dhaka and formation of All India Muslim League, but a family which was so influential in undivided India had its roots in Kashmir was a real shocker. The first thing I saw was the genealogical table of the Khawaja family (later on also called as Nawabs of Dhaka). It started with Khawaja Abdul Hakeem Kashmiri who arrived in Bangladesh in 1730. Some even say that his two sons Khawja Abdul Wahab and Khawaja (Moulvi) Abdullah actually came to Dhaka. I was more than curious to know about this family. It is unfathomable how a migrant Kashmiri family could wield so much of influence at a place thousands of kilometres away from their home, that all the historians of Bengal say that the “history of modern Dhaka is the history of the Khawaja family of Dhaka”. After arriving from Kashmir the family settled in Begum Bazaar, an old Dhaka locality. It is quite obvious that they travelled this long distance in search of their fortune. The elder brother, Khwaja Abdul Wahab, started his business. The younger brother, Khwaja Abdullah, who was away from worldly affairs, started preaching among locals. Ahsanullah, son of Abdullah, however, was an astute businessman. He invested his earnings in purchasing the estates of other Muslim zamindars who were in huge debts. By 1830s, they were the biggest Muslim zamindars of the Whole Bengal province. During the second half of the 19th century and the first half of the 20th century, the Khwaja Family played a historical role in the modernization of Dhaka City and its cultural development. They created parks, gardens, fountains and other recreational centres for the public, and contributed immensely in the field of education. “It was the dynamic Alimullah”, writes Almas Zakiuddin, a retired professor, “who, in 1835, purchased Ahsan Manzil from French traders who had been using the building as their factory for many years.” He learnt English and encouraged members of his family to learn English, and forged ties of friendship with Englishmen. He did some developmental work for the Dhaka Municipality and many other social welfare activities. Land revenue collections ensured that they had no dearth of money, so much so that, in 1873, Khawaja Abdul Ghani sponsored a tapped filtered water project for Dhaka city from his own pocket. He spent a princely sum of Rs 2.50 lakh on this project. Later on, Nawab mooted the idea of electricity for Dhaka and again bore the expenses to the tune of Rs 4.50 lakh to see it through. But the Kahwajas’ of Dhaka did not forget their roots. During one visit to Srinagar when the Nawab found the Jamia Masjid requiring repairs, he donated Rs 20000. This donation led to the intervention of the state government, then owned by Maharaja. A decree was issued that since the donation for repairs was less than the requirements, the people should contribute. For this purpose, for the first time in the history of Kashmir, police stations were designated as the donation receiving points and the repairs of the Jamia Masjid was undertaken. Maharaja had announced that his durbar will pay an equal amount that the people will raise through donations. Salimullah, grandson of Nawab Abdul Ghani is mainly remembered today for three of his greatest achievements. Firstly, the part he played in the partition of Bengal which was implemented on October 16, 1905, that led to the empowerment of East Bengal, and to secure their socio-economic progress by establishing a separate province. Secondly, for laying the foundation of a strong political party, the All India Muslim League, in December 1906. In 1912, he established the Dhaka University. Last Kashmir connection I got to see was at Dhaka airport. A duty-free shop had sweets named as Kashmiri Chumchum and Kashmiri Sondesh. Well, it was the first time I came to know about our contributions in Chumchum and Sondesh sweets. Khwaja Family of Dhaka descended from Banday family of Kashmir who till to this day remains the custodian of Hazratbal Shrine in Srinagar. Yes, they never forgot their root in Kashmir. Throughout 19th century and early 20th century, every year “donation” from the Dhaka Nawab Estate would be sent for the upkeep of Hazratbal Shrine, mosques, Khanqah’s all over Srinagar in Kashmir. All are well documented. Nawab Bahadur Sir Khwaja Salimullah, GCIE, KCSI presided meeting demanding rights of Kashmir’s Muslim population in Amritsar, 1909. Later his son Nawab Khwaja Habibullah and brother-in-law Khan Bahadur Khwaja Muhammad Azam all presided meetings calling for rights for Muslim masses of Kashmir. Nawab Salimullah’s nephew Sir Khwaja Nazimuddin KCIE, CIE a close associate of M.A. Jinnah served as Prime Minister of undivided Bengal (1943-45). It was under his leadership Muslims of today’s Bangladesh voted to join Pakistan. He later became first Chief Minister of East Bengal(now Bangladesh) from 1947-48, Governor General of Pakistan (1948-51) and Prime Minister of Pakistan (1951-53). His younger brother Khwaja Shahabuddin also a veteran politician led Pakistan delegation in U.N demanding rights of the plebiscite for Kashmir’s Muslim population. Many other members of the family played a prominent role in different spheres of life in Pakistan and Bangladesh.